After a solid start to the 2017 NFL season, New England Patriots’ kicker Stephen Gostkowski finally reminded us that he’s only human, too. 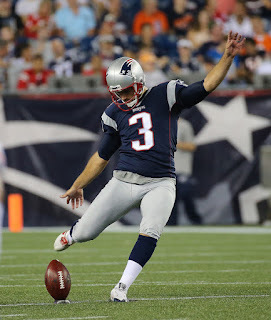 Through the first seven games, Gostkowski went 16-for-17 on field goals, including a career-long 58-yarder against the Carolina Panthers on Oct. 1. But despite making four field goals in yesterday’s 21-13 victory over the Los Angeles Chargers, there were two misses he would really like to get back. In fact, in postgame interviews, Gostkowski admitted that those misses will probably bother him “for a week, probably two weeks” – probably until he gets a chance to redeem himself; which won’t come until after the Patriots’ bye week this week. He’s exactly right. Good teams rely on each other. And when you’re not at your best, they are there to back you up and vice versa. Don’t worry, Gost, you’ll get a shot at redemption.